How do you enter a party? Do you walk in, and quietly shuffle to a corner and play it low-key for the night? Or do you tend to “arrive,” making sure everyone knows you have entered the room? Strap yourself into these kicks, and we guarantee the latter: everybody will know when you’ve shown up on the scene. Kick open the door to the party and boogie your way across the floor wearing these Gold Fish PImp Shoes to ensure you and your noteworthy style shall not be ignored. 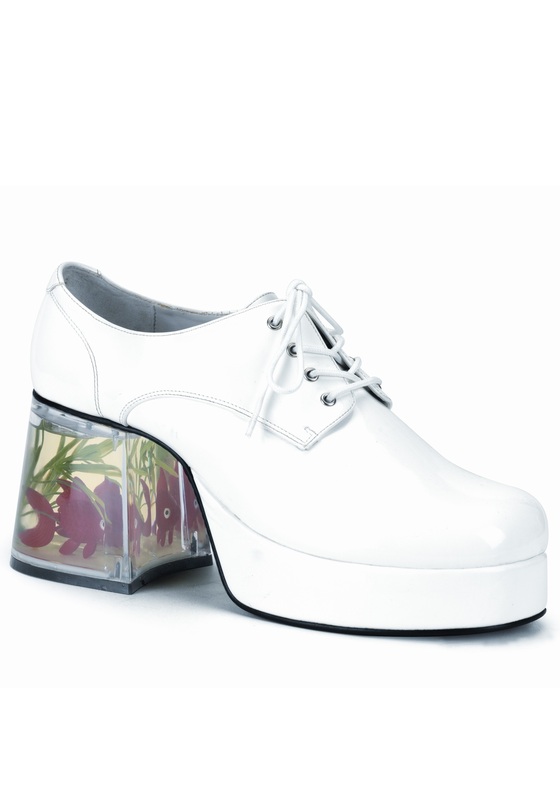 Your friends will be turning up the dico jams all night, hoping to get a glimpse at these transparent heels--filled with water, greenery, and plastic goldfish!--as you high-kick and hip swing into the wee hours. And while you strut your way back and forth across the dance floor, the anti-slip soles will keep you walking the walk, helping you dominate the room with your confidence and get along swimmingly with the crowd.